Ending hunger and malnutrition caused by a lack of steady access to nutritious food is the prominent goal number two of the UN Sustainable Development Goals. The challenge of increasing food supply to feed a growing global population puts sustainability of agriculture and aquaculture on a level with ensuring food security. Food production systems in the 21st century need to optimise the use of water, energy and fertilizers, reduce pollution and soil degradation, and at the same time maximize high quality agricultural yields and fish harvest under increasingly unstable environmental conditions. Small scale farmers need to become more resilient to natural hazards and long term changes, e.g. through improved access to financing and affordable insurance. And finally, international and governmental stakeholders need timely, spatially explicit, precise, and reliable information on upcoming risks for early mitigation measures. 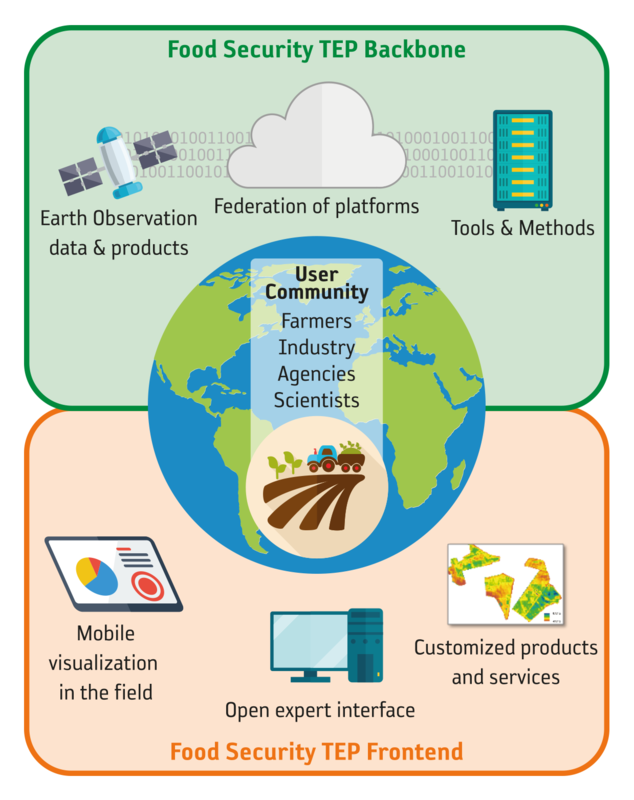 To support future sustainable and efficient farming and aquaculture, the Food Security Thematic Exploitation Platform (Food Security TEP) addresses the needs of a heterogeneous user community by providing a platform for the efficient use of EO-datasets. EO data plays a major role in understanding and managing the global food supply on all scales. Food Security TEP will provide services and applications where the full power of Copernicus Sentinel-1 and -2 satellites as well as additional datasets are required. It will serve as a platform where users can easily access comprehensive satellite datasets in a timely manner and process these directly by using a range of available generic applications. By providing a service to efficiently generate spatial information in a cloud and download resulting products, Food Security TEP aligns with the paradigm shift of bringing the users to the data and thus enabling the processing of large datasets. The Food Security TEP frontend will provide three different interfaces: A free and open interface for expert users will be the entry point to the comprehensive functionality of the platform including fast and easy access to satellite and ancillary data as well as the tools to explore, analyse and process these datasets. A mobile version of the platform will allow the on-site visualization of EO information products and their time series via smartphone and is designed for easy and intuitive use. A customized version will provide additional, user-adapted information and interfaces for the monitoring and management of fish and agriculture farms as well as confidential data management in a secure environment. In order to demonstrate the platform’s ability to support agriculture and aquaculture with tailored EO based information services, service pilots will be implemented. A first pilot will include crop monitoring and the derivation of advanced biophysical parameters and yield predictions to increase efficiency of agricultural production on farm level in Europe and Africa. Another agricultural and an additional aquaculture service pilot will focus on applications in Africa and will be further defined based on user requirements collected during the first year of the project. Additionally, the user community will have the possibility to interact and communicate on Food Security TEP to jointly improve the use of satellite data for food security. The consortium developing Food Security TEP and implementing the pilot services is led by Vista Remote Sensing in Geosciences GmbH, Germany supported by CGI Italy, VITO NV, Belgium and Hatfield Consultants, Canada.